Roth conversions are on the rise. Are they right for your clients? Roth IRA conversions are on the rise following tax law changes — expanding access for more clients to take advantage of the opportunity to diversify the tax status of their retirement savings. 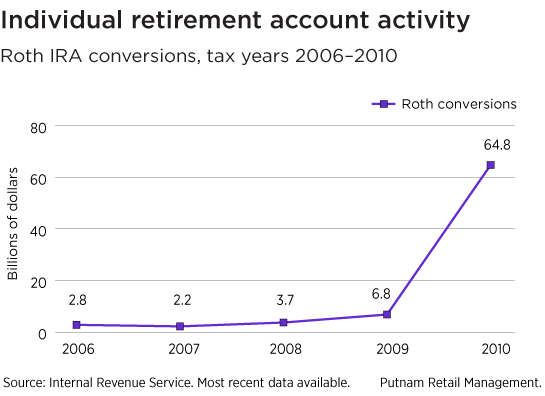 Converting tax-deferred retirement assets, such as traditional IRAs, to a Roth increased significantly in 2010. This took place after new tax provisions were passed that allowed taxpayers at all income levels to access conversions. The IRS found the amount converted to Roth IRAs rose to $64.8 billion in 2010 from $6.8 billion in 2009. The availability of Roth conversions was expanded further in 2013 with the passage of the American Taxpayer Relief Act. This law made Roth conversions available to all participants within 401(k) plans if the plan offers a Roth account option and specifically includes an in-plan conversion feature. In-plan Roth conversions had been limited to participants who had a “distributable event,” such as reaching the age of 59½ or terminating employment. Clients who hold most of their retirement savings in tax-deferred vehicles, such as IRAs, may find a Roth conversion option appealing. Putnam’s Roth IRA Conversion Evaluator tool helps clients determine if they would benefit from a conversion.